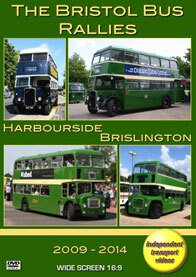 The ‘Bristol Bus Rallies’ are firm favourites with bus enthusiasts on the bus rally calendar in the United Kingdom. Each year, the first of the two events is held on the redeveloped Harbourside area of central Bristol in May. The second is held in August on the large ‘park & ride’ car park in the suburb of Brislington, which was of course is not far from the site of the Bristol Commercial Vehicles factory where the ‘Bristol’ bus chassis were built. In the past the independent transport videos cameras have recorded the happenings at these events for you to enjoy. This video programme was filmed at eight events at the two venues between 2009 and 2014, and none of the footage has been seen before. We visit the Harbourside rally in 2009, 2011 and 2013, and Brislington is filmed each year from 2010 to 2014. It is interesting to see the different preserved buses and coaches that have attended these events over the years, with new preserved vehicles arriving each year including some in different liveries. Of course the majority of the exhibits come from the Bristol Tramways/Omnibus group of companies, but there are plenty of other fleets to whet your appetite! Most of the filming is done either on site or out and about on the roads adjacent to the rallies and on the Centre in Bristol. There are also a number of ‘extras’ for you to enjoy! At Brislington in 2010 we go for a ride on Crosville Bristol RELL6G, ERG53 (UFM 53F) and later visit the Bristol Vintage Bus Group site at Flowers Hill. At the Harbourside rally in 2011 we take a ride on Bristol Tramways Bristol K5G, C3336 (GHT 154) to Filton where you can admire the interior and listen to the Gardner engine making all the right sounds! At Brislington in 2011 we go out on a New Zealand Bristol RELL6L, with Hess bodywork to the city centre and back to the rally calling for a photo stop by the former BCV factory in Brislington. At Brislington in 2012 our cameras record the magnificent line up of Bristol REs and an RE chassis – celebrating 50 years of the RE, 1962-2012. Also at the Brislington event in 2013 and 2014 we visit the Avon Valley Railway station to record the action, as the buses operate the shuttle service to and from the park & ride car park. So there is plenty of variety and action for you to enjoy. Sit back, take your seat and visit the ‘Bristol Bus Rallies’. Duration : 104 minutes (approx).